Albi Gilmer has been instrumental at The Andrews Institute Rehabilitation in implementing standardized return to play decisions across multiple Andrews Institute facilities using the Move2Perform software. According to Albi, “We have actually started a process of re-writing protocols to include Move2Perform testing to assign risks levels for rehab following many common surgeries: ACL-PTG reconstruction, meniscus repair, PCL repair, and combinations of these surgeries in the lower extremity. We are using it for the upper extremity as well for labrum repairs, SLAP injuries and repair, sub-acromial decompression, ulnar collateral ligament repair, etc." Read about the benefits of using the Y Balance Test and Functional Movement Screen together. Albi has a BS in Biology from the University of Alabama and graduated from the University of Mobile with a MS in Physical Therapy. 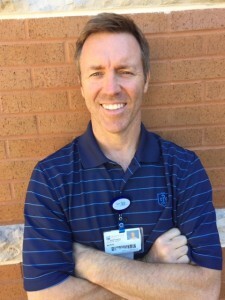 He has been practicing for 17 years and has been the Facility Manager of The Andrews Institute Rehab in Gulf Breeze, Florida for 5 years. He specializes in general orthopedics, sports medicine and mechanical diagnosis and treatment of the spine. The Andrews Institute Rehab facility in Gulf Breeze primarily treats orthopedic injuries from the very young to the geriatric population. They also treat higher-level neurological disorders such as strokes, closed head injuries, and balance disorders. The Andrews Institute Rehab clinicians in Gulf Breeze (8 PTs, 2 PTAs and 6 ATCs) see elite athletes including professional and collegiate persons in a variety of sports.